This post first appeared in G Style Magazine 12.03.09 written by me. Original post can be found here. 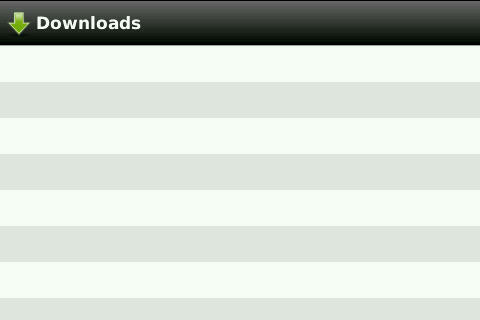 Opera releases Beta 2 of its popular Opera Mini 5 app for the BlackBerry smartphones. 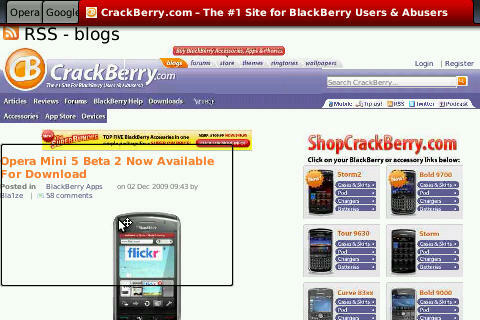 This app is a third party browser that replaces the native BlackBerry browser. It is comparable to other third party browsers like Bolt and Skyfire. 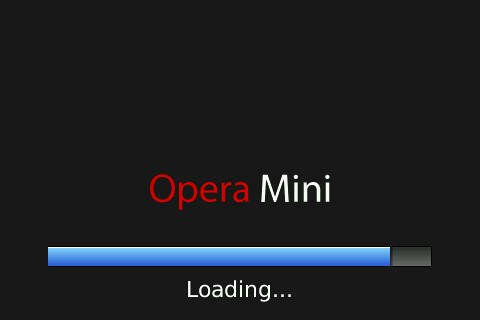 For more information about Opera, you can visit the Opera Mini website here: http://www.opera.com/mini/next/. Loading screen. Loads fairly quickly. 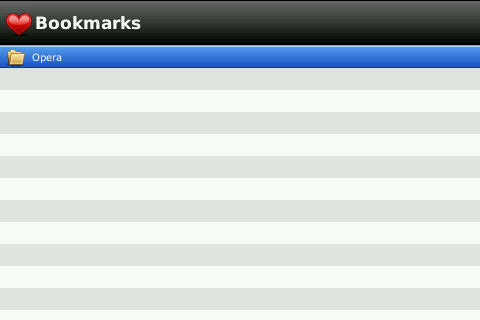 On my BlackBerry Bold 9000, it took about 2 seconds to load up. This is the start screen. Opera Mini 5 starts on the popular Speed Dial screen similar to what they use on their desktop Opera browser. It should also be familiar to those that use Google Chrome which also uses a similar feature. You can have up to 9 Speed Dial sites loaded up. This is very useful as it saves you some time when loading up regularly visited sites. To add a site, just click on an empty slot and the above screen pops up. You can either enter a new address or choose from the list which is based on the history of websites you visited. 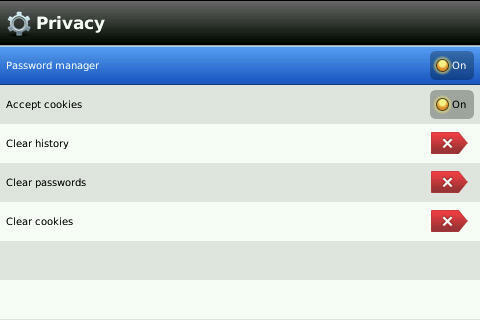 Pressing the BlackBerry button at any screen in Opera will bring up the above drop down menu. It has options to bring up the Speed Dial screen, go forward or backwards in your history, reload a page, or turn close the program. You will also notice a + tab up above as well as what looks like another drop down tab. Pressing the + tab allows you to open up a new page in a new tab! That is something the native browser does not do. 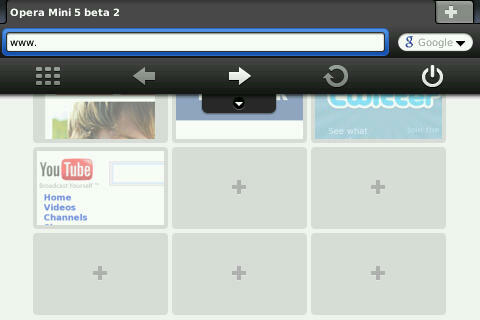 Opera Mini allows for tabbed browsing. You switch between tabs with the trackball after pressing the BlackBerry button. The bottom drop down tab brings up the following. 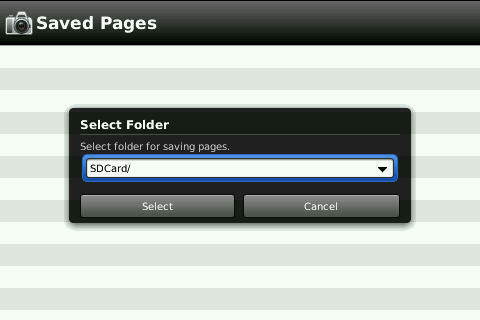 These are usually things that appear in the regular BlackBerry menus but Opera made them all integrated into the user interface. The menu lists standard browser items bookmarks, history, saved pages, downloads, settings and find in page. One item to note on the Saved Pages section. Seems that you can save them to your media card. This is great if you want to save some pages for offline viewing later. Nothing has changed in the settings screen. Still the same as the previous beta. Most are standard features. Take note of the “Opera Link” setting which allows you to sync your bookmarks, speed dial and search engines with the desktop version of Opera. Very neat function there. Something new in this build is how the browser integrates into the standard BlackBerry menu. 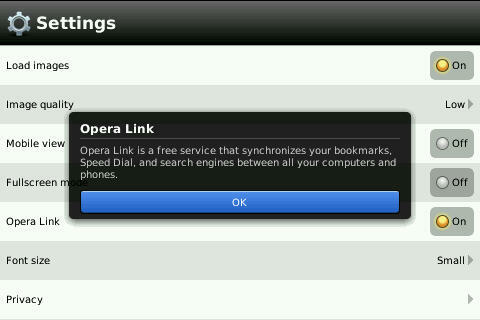 Previously, beta 1 only allowed you to get links in Opera Mini. This was quite annoying because some links you only wanted to open in the native BlackBerry browser. Now however, Opera added the context to open up links in the native browser. This is much more useful especially when trying to open up links to OTA downloads and install files. Do I recommend Opera Mini 5 Beta 5 for most users? Yes. It is a speedy browser that loads many pages quickly and accurately. 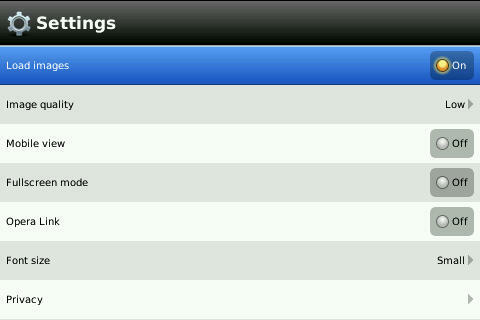 Some sites that are troublesome in the native browser open up with no problems in Opera Mini 5. Would I use it as a completely replacement? No. I rather think of it as a supplement to the native browser. 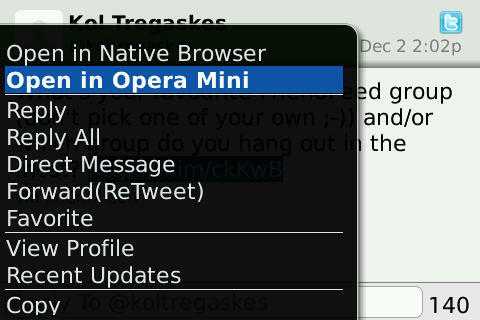 The native browser is integrated tightly into the OS and comes natural to anyone who knows how to use a BlackBerry. Opera Mini 5 takes some getting used to as many of the standard shortcuts either do not work or are quite different. Anyone wanting a more powerful browser however should consider downloading Opera Mini 5. Remember however, this is a beta build so there are bound to be bugs in the app. I’m not sure if this is a bug or coincidence, but upon installing the app, my BlackBerry Bold would constantly switch to EDGE and would not go back into 3G mode. After uninstalling the app and rebooting the OS did it go back to 3G. User experience may vary. Disclaimer: I have not been paid or asked to do a review for Opera. This review is done by myself and to inform those of what the app is capable of. I have in no way, shape of form been contacted by Opera prior to this review.